New brands seemingly appear every week, much to the delight of vodka devotees and disciples. The Adams Beverage Group stated that there were almost 300 new vodka brands introduced in the US in the last 5 years. So it is time for another update. TheFiftyBest.com held a private tasting with 31 premium vodkas, all imports, all 80 proof and all without flavors. The tasters invited were all professional vodka drinkers. They included: chefs, restaurant owners, bartenders, wine and spirits journalists, retailers, mingled among a number of aficionados. Method: The products were served "blindly" to the tasters, completely unaware of the brand being tasted. The order of service was randomly selected through a lottery system. Each of the vodkas were poured into fresh glasses from new sealed bottles, and served slightly above room temperature, one brand at a time. Then, everyone was asked to write down their impressions of each product. Tasters were given the opportunity and option of a retest, if needed. Water on the side and rice crackers were provided to cleanse the palate following each taste of a brand of vodka. There was a resting period after the first flight of 10 vodkas, with a food break after the second flight. The scoring was done on a 5-point system, with 5 as the best. There was no discussion amongst the tasters until their scorecards had been completed. The entire total was added up and the winners were determined from 1 to 31, solely based on the score received. The tasting notes that follow the rankings are a summary of the results, and all replicate commentary has been eliminated while contrasting opinions have been summarized. Prices quoted are for 750ml sizes. Prices will vary by state. Country of origin is given, with a few tidbits added for each brand. History: The word, vodka, is a derivation of the Russian word for "little water." Vodka came to be a huge part of the Russian culture, as it was being distilled even before the word vodka came into general use. Polish historians claim that vodka was first produced in 1405, and history coupled with rumor state that it reached Russia from Poland. Vodka can be made from potatoes or various cereal grains that contain starch, principally corn, rye and wheat, but it can also be made from fruits and vegetables if you feel like setting up your own distillery in a corner of the backyard or kitchen some time later today. 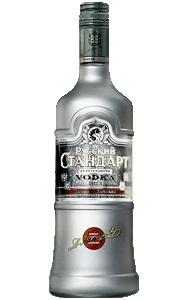 A common property of vodkas produced in the USA and Europe is the extensive use of filtration prior to any additional processing, such as the addition of flavorings. Filtering is sometimes done in the still during distillation, as well as afterwards, when the distilled vodka is filtered through charcoal and other media. The U.S. government officially describes vodka as "a neutral spirit, so distilled, or so treated after distillation with charcoal and other materials as to be without distinctive character, aroma, taste or color." However, this is not the case in the traditional vodka producing nations; so many distillers from these countries prefer to use very accurate distillation but minimal filtering thus preserving the unique flavors and characteristics of their products. This tasting proved vodka’s range of aroma, texture and flavor. The governmental definition was correct on one point however - vodka does not have any color. 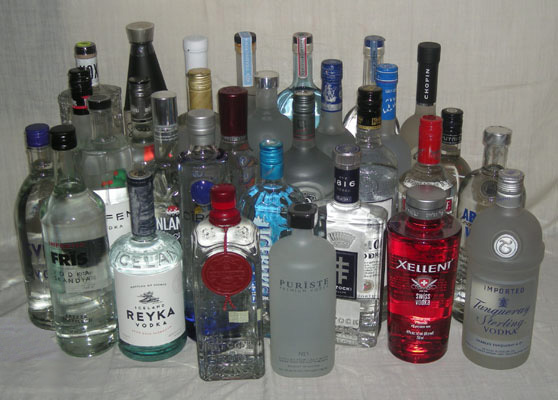 Today, vodka is the largest category of distilled spirits (25%) on the market. The super-premium category (over $25) is the fastest growing segment. Although vodka is traditionally drunk neat in Eastern European and Nordic countries, its popularity elsewhere owes much to its usefulness in cocktails and other mixed drinks, such as the Bloody Mary (tomato juice), the Screwdriver (orange juice), the Cosmopolitan (cranberry juice, lime juice & triple sec), Sea Breeze (grapefruit juice & cranberry juice), the vodka tonic, and the vodka martini. The Art of Tasting Vodka: While many prefer to drink their vodka ice cold, it is best, for tasting purposes, to pour it into a glass at room temperature. Cold tends to dampen the aroma and deaden the taste buds. Look at the liquid; it should be clear and bright, absent any cloudiness. Second - smell or "nose" the vodka by swirling it in the glass. Watch out for sharp, pungent odors or a perfumed smell. Third - take a small sip and roll it around your tongue. Look for a pleasant flavor and, yes, it varies from person to person. Fourth - draw a little air over the vodka to release its flavors, then swallow it and evaluate the finish. 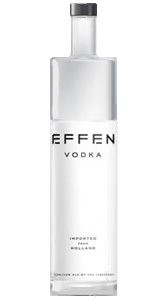 Fifth - pure vodka should feel smooth on the tongue...with no "bite," and be pleasant but not overpowering, nor have an off-aroma or flavor and little aftertaste. You're ready!!! THE TASTING This tasting dispelled some myths about vodka! To begin with, the notion of "triple distilled" or "triple filtered" is pure hype. The process of distillation is a continuous one, recirculating the solution until all the alcohol is vaporized out. Also, the source of the vodka (potato, wheat, sugar cane) does not affect the final product. Vodka is the easiest and cheapest spirit to produce (with high profit potential). There are no oak barrels or long aging process. So much for what you might hear, it is all about the water, the bottle, the label, the marketing. Smooth, sweet finish, rough, clean, intense, exciting, classic. Intense, sweet almond, burns, sweet tones, smooth, pleasant, classic. Wheat based- filtered through peat, not charcoal. Neutral, grassy, smooth, hot peppers, polished, citrus, pure, mellow. 4. Three-Way Tie- Xellent - (Switzerland)- $33– Rye based- 3 times distilled- glacier water from the Swiss Alps. Bread-like, smooth, bitter, intense, harsh, refined. Jewel of Russia - (Russia)- $28- Wheat & rye based- Quadruple distilled, 5 step filtration- Metallic, alcoholic, smooth, spicy, peppery, clean, classic. Smirnoff - $15- ONLY domestic vodka included as a benchmark, although they do produce a Russian version distributed outside the U.S.- 10 times filtered- Complex, full-bodied, clean, spicy, harsh, good aftertaste, mellow. 5. Puriste - (Austria)- $40– Wheat based- 6 times distilled- water from the Austrian Alps. Good finish, smooth, long aftertaste, no nose, and complex. 6. Four-Way Tie - Finlandia - (Finland)- $22– Wheat based- glacier spring water. Salty, spicy, slightly bitter, smooth, tangy, mellow, tasty. Reyka- (Iceland)- $28- Wheat based- filtered through lava rocks. Spice, woody, alcoholic, bitter, smooth, toasted almonds, pepper. Imperia - (Russia)- $35- Premium brand for Russian Standard- Wheat based- filtered through quartz crystals, 8 times distilled. Clean, spicy, refined, flavorful, balanced, neutral, minerals, rubbing alcohol. Tanqueray Sterling - (United Kingdom)- $15– Wheat based- 3 distillations. Citrus, silky, spicy, bitter, sweet, harsh, balanced, dirty, smoky. 7. Four-Way Tie - Potocki - (Poland)- $38- Rye based, unfiltered - Twice distilled. Full flavor, grassy, bitter, fruity, clean finish, floral, no taste, sweet. Chopin - (Poland)- $32- Potato based- distilled 4 times. Licorice, floral, spicy, citrus, honey, alcoholic, rough, rubbing alcohol, smooth. Belvedere - (Poland)- $30– Rye based, 4 distillations. Sharp, acidic, smooth, cedar, spice, intense, rough, flavorful. Vox - (The Netherlands)- $28- Wheat based- 5 times distilled. Lemon, smooth, short finish, peppery, no flavor, silky. 8. Two-Way Tie - Ketel One - (The Netherlands)- $26– Wheat based. Clean finish, anise, vegetal, smooth, intense, soft & subtle, neutral, bitter. Van Gogh - (The Netherlands)- $28– Wheat, corn & barley- three distillations. Clean, smooth, bitter, complex, spice, fire, biting, rich, intense. 9. Two-Way Tie - Boru - (Ireland)- $20– Wheat based- distilled 5 times. Clean, rough, citrus, smooth, intense, alcoholic, sharp, classic, berry like. Fris - (Denmark)- $24– Wheat based- freeze distilled 6 times. Light, clean, bitter aftertaste, smooth, buttery, good finish, off nose. 10. Three-Way Tie- Zyr - (Russia)- $32- Wheat & Rye based- 9 filtrations, 5 times distilled. Citrus nose, smooth, slightly bitter, refined, pleasant, simple. Iceberg - (Canada)- $20– Sweet corn based. Sweet, butterscotch, intense, rough, fruity, refreshing, bubble gum. Three Olives - (United Kingdom)- $20– Wheat based- quadruple distilled & filtered. Citrus, sharp, smooth, harsh, spice, rich, rough. 11. Six-Way Tie - Grey Goose - (France)- $30- Wheat & Rye based (in Cognac) - Salty, alcoholic, smooth, peppery, citrus, hot, rough, great flavor. Svedka - (Sweden)- $14– Wheat based- distilled 5 times. Citrus, hot, short aftertaste, spice, tart, classic, rough finish. Stolichnaya Elit - (Russia)- $60– Wheat & Rye based- 4 distillations. Freeze filtered. Balanced, smooth, burns, easy drinking, hard to drink, good finish.Ciroc - (France)- $35– Grape based- 5 times distilled, cold fermentation. Marketing taken over by Sean Combs. Lemon, lime, almonds, fruity, citrus, slight burn, floral notes, short finish. 42 Below - (New Zealand)- $22– Wheat based. Only Southern hemisphere vodka tasted. Citrus, rough, spicy, bitter, floral notes, slight burn. Smooth. Level - (Sweden)- $30– Wheat based. From makers of Absolut. Burning, smooth, herb like, perfume, mellow, citrus, rough, one note spice. 12. Three-Way Tie- Citadelle - (France)- $30– Wheat based, distilled 5 times. Vegetal, hot finish, sweet, peppery, citrus, green, brash, oily. Ston - (Estonia)- $22– Wheat based, 4 times distilled, filtered through limestone. Wheat, fiery, balanced, harsh, earthy, grainy, spicy, clean. Sputnik - (Russia)- $26- Not yet available in US- Winter wheat based. Distilled 3 times. Hot, bitter, burns, nutty, heat, rough, no nose, full-bodied.